The rise of fake news has affected many people's faith in the internet as a reliable source. In order to help with the problem, Adblock Plus maker eyeo is launching a new browser extension called Trusted News. Available free for Chrome browsers, the extension works by checking domains, websites, and news sources against the world's largest network of fact-checking databases. 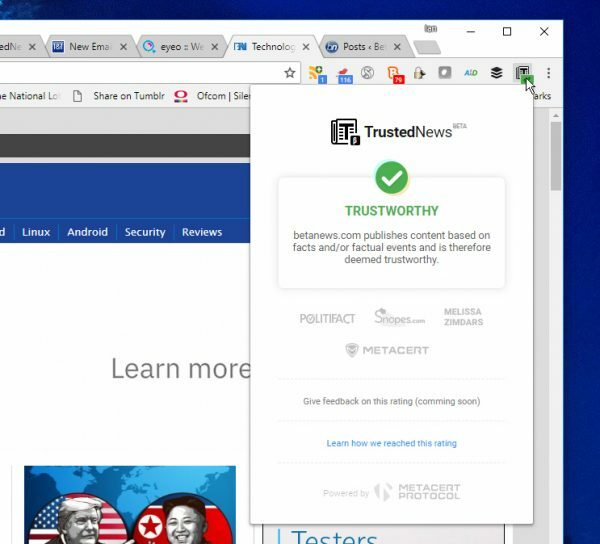 After installing the Trusted News extension, users can navigate to websites as usual but they will now notice a green check-mark or other flags on the extension indicating the nature of the sources used by that site. Besides a green check-mark indicating trustworthiness, other flags mark sites as biased, untrustworthy, satire, clickbait, user-generated content, malicious or unknown. The classification of each news source is taken from fact-checking organizations and stored in the MetaCert Protocol registry to provide unbiased, democratically assessed information on the integrity of each website and news source. Users of Trusted News can also contribute to the registry of sites by reporting for evaluation any news sources and other websites that they may discover. "Fake news is profoundly affecting our society and our ability to make informed decisions as citizens. While we don’t profess to have solved the entire problem yet, we are proud to launch Trusted News as a first, humble step that we will continue to improve as it pushes beyond beta," says Till Faida, CEO of eyeo. "Trusted News is still new, but there are two secrets in the sauce. First, it is a solution for users, not an ambitious plan to reform platforms or information sources; and second, it separates the fact-checkers determining what is fake and what is not from the actual product applying the determination." You can find out more on the Trusted News site or download the plugin from the Chrome Web Store.